Roscommon native, a teacher in Ballina and Sligo and driving force behind the Council for the West. The emeritus Bishop of Elphin has died. Christy Jones who was 82 was born in Rathcroghan, Roscommon, the second youngest of a family of 11. He was ordained in 1962. A brother also joined the priesthood while four sisters joined the religious life. The former bishop was a teacher for a time in St Mureadach’s College in Ballina and from 1965 to 1971 at Summerhill College, Sligo. Later he served as Director of Sligo Social Service Council from 1973 to 1987. During his time with the SSSC he was an activist and forceful advocate for traveller rights and the poor. 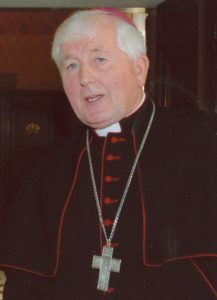 Subsequently, he served as Administrator at Sligo Cathedral, and in 1984 succeeded Dr. Dominic Conway as Bishop of Elphin. As a founder member of the Council for the West, he was a powerful voice for development which would help sustain rural communities west of the Shannon. Bishop Kevin Doran said in a statement that he died peacefully on Friday surrounded by his family.